As ALWAYS, great blog. Your daily commitment to reach out and help others is absolutely wonderful ! Have a super day !...and N.O.P.E. I vividly remember day one.....mostly because it was earlier this week. HA HA! But I already know that I never want to do it again. I'm feeling very nervous about the long weekend but am trying to make a plan so I can minimize any issues. I might have to take it one hour at a time. I am going to take your advice and believe in myself. N.O.P.E. Marilyn.H.July.14.14. Thanks for helping me to feel grateful for Fall...yes, I like the leaves and I love the cooler weather but I HATE the idea that the pool will close. I am having such a hard time doing much of anything these days...today it is raining and in the 50's and really looks and feels like Fall. I am afraid there is a much lower chance of rain tomorrow for that disgusting dove hunt...and it is supposed to be 70. I just cannot even think about it. I work tomorrow, off Sunday, work Monday, and we take our daughter back to catch the train Tuesday. We had a really nice take out dinner last night, got subs from a local place and they were amazing. We had key lime pie and chocolate pie to celebrate my husband's birthday and then we watched the movie "Arrival" which my daughter was certain her father would love. She was right, he DID. She told me that it was about aliens and it was "very cerebral"...she wasn't sure I would like it, LOL. Guess she doesn't have the same impression of me that she has of her father. It was a good movie and contrary to her expectations, I liked it and I did not fall asleep, I will admit that there were a couple of times when I thought I might...to be fair, I fall asleep in very intense movies. Happy September everyone and happy Friday for those who do not work on weekends. Great blog Marilyn...continuing to say prayers for the Texas victims. The lake is really churning and spewing white caps...no chance of taking a dip even if the weather warms up! Nothing to smoke about...always something to do!!! September 1st. Don't know where the summer went! I love fall tho with all the pretty coloured leaves. I always feel like September is a time for new beginnings. I guess it reminds me of the days when we would start school. Sept. 15th was the day I met Brian too. I hope everyone has a good day here. Sorry to rain on everyone's Fall sunshine - but I am NOT in the mood for it! The weather has been so chilly that my beloved summer pool has almost had ice cubes forming, and I have not been able to do my final laps of the season. Aaah it's crazy cold here today too, it never made it above 50 ° F and I had to start a fire in the wood furnce brrrrrr my house was only 63 inside brrrrrrrr and 5 hrs west of me in Quebec it snowed yesterday bah humbug for sure Nancy but no white crap here but it's been showery all day but we need rain we're in a drought but none of the white sh#the right Youngatheart.7.4.12? Surely we'll all get some good weather yet! Positive attitude and good vibes and no smoking because we don't do that anymore! Fall on the Florida Gulf Coast means rain, rain and more rain, but when the skies dry up, the summer's heat is gone and life here is a thing of beauty. Happy September. The picture below is Naples, FL, down the road from me. Home of Tommy and the bacon margarita! Why yes Dale jonescarp.aka.dale.Jan_2007, now that you mention Tommy, I think I see him standing down on the end of the dock. Is that you, pir8fan? Watch out, Pati, you might get a whole lotta visitors! I love fall! Just hope it doesn't get too cold too quickly for you Marilyn! Happy weekend! I'd love to take those 15 degrees Dale, I've got my fuzzy pj's on and I'm still chilly but I don't want Mark to start a fire in case it gets too hot for sleeping and if I open the windows it'll be freezing in here by morning. thanks for sharing. I'll give you each 10 degrees so I can get that 72 down to blanket temperature. It's really too warm to sleep well. Ellen and I will share them right elvan? And then maybe we'll all sleep comfortably thank you Dale you're a good guy. Yes! 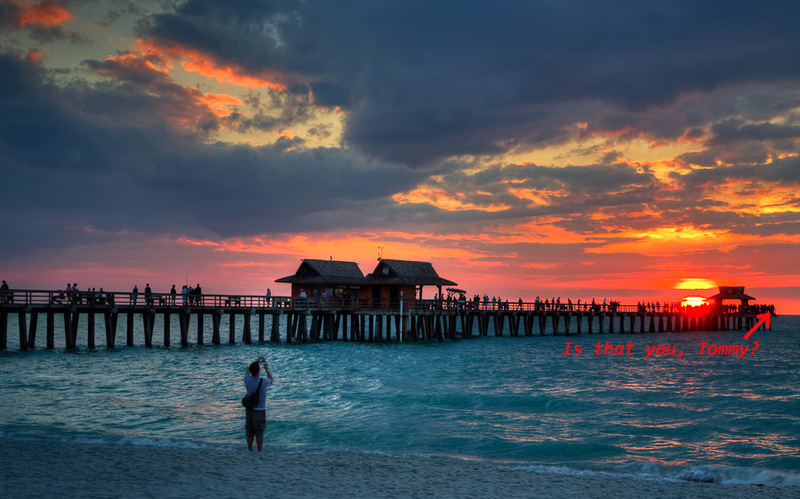 That is me on the Naples Pier watching that spectacular sunset! One of the perks of living in paradise! I am also willing to share 15 degrees with others! Maybe 25 for a few days! If we could get below 70 for a day or two, the local would get a chance to show off their winter wardrobes!